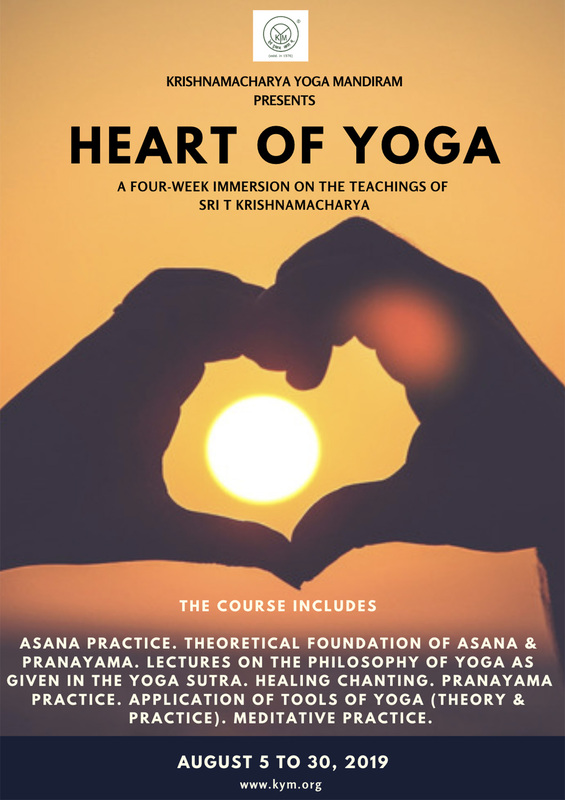 This four-week programme presents the principles of Yoga, based on the teachings of Krishnamacharya. This programme is addressed to participants who desire to take up a serious study of Yoga. While there is a popular misconception that Yoga means practice of certain postures only, the Yoga Sutra presents Yoga as a means to relieve one of pain and suffering The Yoga Sutra gives a multiplicity of tools including Asana, Pranayama and Dhyana. It provides an insight into the rich and varied dimensions of Yoga, its value as a timeless and universal philosophy, and its practical relevance. A Guest lecture on different aspects of Indian culture will also be held on one of the days. This course is non-residential and participants will have to make their own arrangements for boarding and lodging. Breakfast will be provided by KYM during the course. Registration for the course will be closed two months prior to the date of commencement of the course, or as soon as it gets filled up, whichever is earlier. Owing to our focus on providing participants with the highest quality of learning experience, we limit participation in all our courses. Consequently, our courses are almost always filled up much before the last date of registration. It is in your best interest to register well in advance to secure a confirmed spot. It is suggested that you keep checking our website to know the status of course registrations. Participants who register after the course is filled up will be placed on the waiting list and will be accommodated pending cancellations, if any.